It took us a longer time than normal to get up to treeline. Deep drifts of snow made things difficult. Since we were a party of 3, we took turns in the lead. 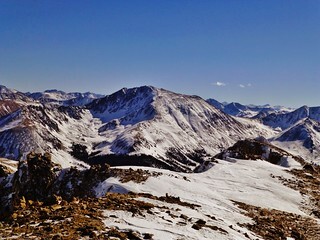 Around 11,300 ft, Frank took this picture of Star Mountain (12,941 ft). Thankfully, I had plotted the GPS coordinates, so even though there wasn’t a trail, we knew where we needed to go. 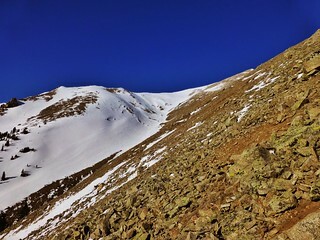 After about 45 minutes of hiking, we ran into a trail left by another snowshoe hiker, possibly Doggler’s (14ers.com) trail from 20 days prior. Once we had a trench, we were able to pick up the pace. 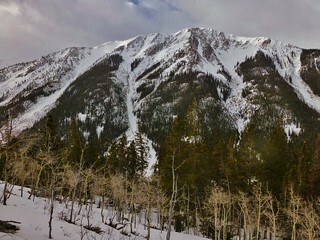 We stashed our snowshoes around treeline (~11,700 ft) by a rocky outcropping. Around this spot, we noticed a bit of wind, but it wasn’t bad. 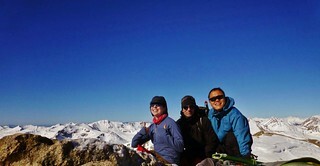 The sun was still shining and we were excited to be about halfway to the summit. From the spot we ditched the snowshoes, we had a choice to go right or left, and we decided to go to the right. Soon, we found ourselves doing some 3rd class scrambling. 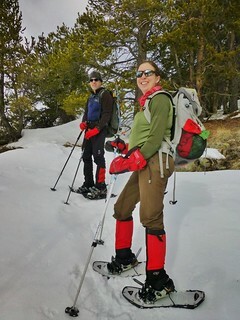 It was fun, but tricky with snow and ice coated rocks. Later, we learned that going left from that spot, one can avoid the scrambling and the route is much more straight forward! The South Slope was mostly free of snow as it had been scoured by the wind. We took a couple breaks on the way up, to catch our breath and have some snacks. 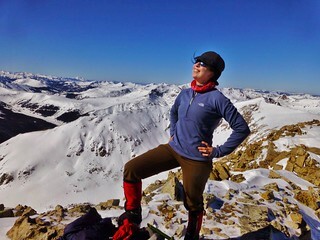 The mood remained hopeful as it continued to evolve into a gorgeous bluebird day in the Sawatch. As we approached the final summit bit, Frank graciously let Tom and I plow ahead. 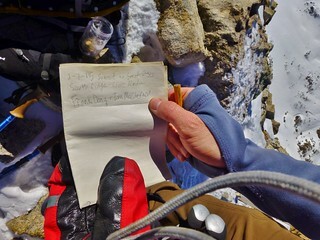 Tom, ever the gentleman, declared, “Ladies First!” and so I charged for the summit. I could not be happier with our wonderful day! We spent about 30 minutes on the summit. Soaking in the amazing views and just astounded at the weather. This picture is looking south from the summit. 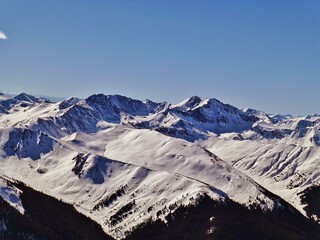 La Plata Peak (14,336 ft) in all it’s splendor. 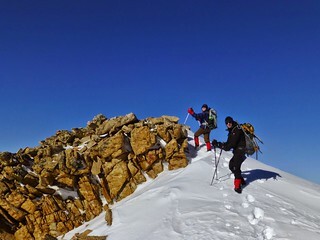 Back in 2012, I led a CMC trip up the crescent shaped, gendarme laden Ellingwood Ridge. It looks nearly impossible from this angle, but it is only 4th class. We identified Garfield and Grizzly Peak. I’d like to climb Grizzly Peak later this year, so it was neat to check it out! Mt. 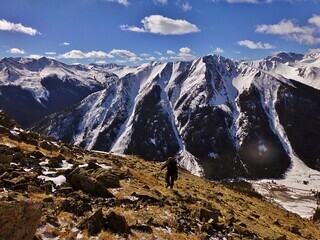 Elbert, the high point of Colorado. I had climbed this peak a few weeks prior, so it was fun to see it from the west. 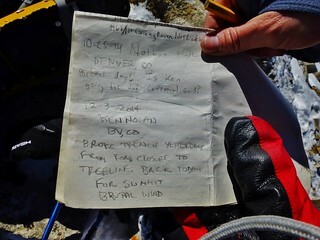 Our Summit Signing. The guys didn’t care to sign it, so I wrote something for us. Local legend, Ken Nolan was here a couple months ago. After lingering luxuriously on the summit, we headed down. 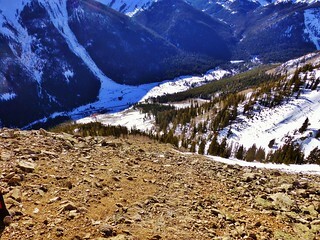 The wind picked up as we descended so we kept a pretty good pace to stay warm. 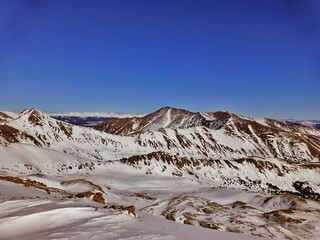 Frank took this picture at one of our break spots at 12,500 ft. This route is pretty much straight up and straight down. If you have knee problems, the down bit is not fun! I was definitely grateful that I had my trekking poles. Taken from the same spot as the picture above, just looking upslope. The last mile back to the car was really tricky as we kept post holing. Even with snowshoes on, we’d sink in up to our knees from the soft snow. I was really happy when we got back to the car. 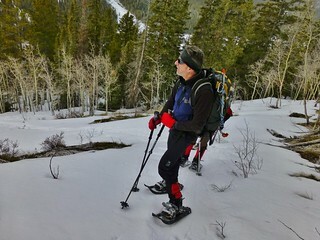 My knees and hip flexing muscles were pretty sore from the snowshoes plunging through the snow and I could tell that the guys were just as worn down. We all had big smiles as we drove down 82 back towards Leadville. Lackawanna Peak was challenging in spite of it’s closeness to the road and it’s relatively short statue. It has a Napoleon complex, like none other. It will make you pay if you are not prepared. So, come with a fresh set of legs and remember the trekking poles for the way down! 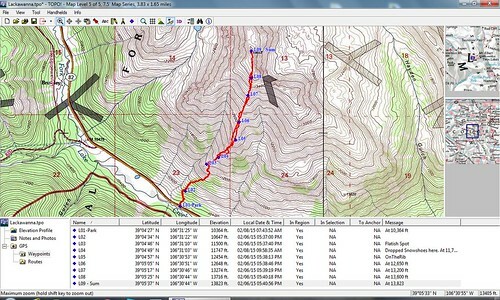 This entry was posted on Sunday, February 8th, 2015 at 6:55 pm and is filed under Mountaineering, Snowshoe Hiking. You can follow any responses to this entry through the RSS 2.0 feed. Both comments and pings are currently closed.